no after the ordeal I went through that sucker might sit there till june! NO GARY MINE IS STILL UP UNTIL AFTER NEW YEARS…..BUT WAIT DO WE HAVE TO TAKE THEM DOWN? Nope. Mine comes down this weekend. No. This weekend hopefully! I’m already tired of all the Christmas falderal! My parents brainwashed me to believe it’s bad luck to keep your tree up past New Year’s Eve. No way! 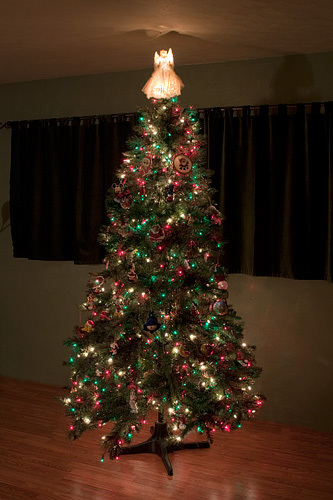 We keep our tree up until Little Christmas which is January 6th. That’s when the wise men found their way to the manager. I like to keep ours up until New Years day but Paula likes to take it down right away. Take a guess as to who wins that battle. Yep, our tree is down. Mine is down already. Kinda miss it, but it’s nice having the space back! The artificial one in the den is still up, and I’ll take it down this weekend. The real one in the studio had to come down right after Christmas because it was dying.